Is The Secret to Affording Travel Being Rich? In second grade I remember being jealous of the girls who would come back from vacations with braided hair wraps. You know, the colorful string hair wraps that were made of friendship-bracelet type string twisted for a few inches around a strand of hair. You could get them on vacations to tropical places. It was extra cool if they had charms, such as little silver dolphins, wound into them. Any millennial girl will remember these things. Only, some millennials will remember actually going somewhere and getting their hair wrapped, and the others will remember being jealous of the kids who got their hair wrapped. I wanted to go on vacation and get my hair wrapped so badly. My family vacations were short road trips and visits to a cottage in a neighboring state in the Northeast. While full of family and love, there were no hair wraps there. I knew my family couldn’t afford to travel (in the way that I wanted to atleast). Why am I talking about hair wraps? I was recently reading this article, Your Obsession With Travel Sure Feels Classist to Me, and it brought up these childhood memories. In the article, the author talks about being ashamed of never having left the U.S. and her childhood memories of being embarrassed at school when other kids were going to Disneyland and cruises and such. I completely forgot about that part of my childhood. I had friends who went to Disneyland or Jamaica for family vacations. Cruises were a big thing. In high school, I had friends who went to Europe. I couldn’t go on these trips and I knew it. Now it wasn’t the experience of travel that I was jealous of at that age (let’s be clear it was just about the hair wraps) but I did feel a little FOMO and a weird sense that the other kids were better off than me. The message I got was that travel was for rich people. I studied abroad in Europe during college and caught the travel bug. I scoured websites such as Skyscanner to find good deals, flew Ryanair more times than I could count, and stayed in the cheapest hostels going. For the first time in my life, I realized that travel was actually accessible to normal, not rich people. Now, as the author astutely points out in her post, travel is not accessible to everyone. There are class, race, citizenship, ability and other considerations that come into play that make travel not as accessible for everyone. In addition, the author truly believes that she cannot afford to travel. Are travel rewards the secret to affordable travel? I started earning travel rewards five years ago when I was a struggling recent graduate and my now-husband was working across the country. Earning travel rewards means collecting points and miles and redeeming them for free travel including flights and hotel stays. I collected hundreds of thousands of points on a $33,000 salary back in 2012. It allowed me to fly to see him and vice versa every few weeks. It also allowed us to go on weekend vacations to anywhere we wanted in the country. Points and miles made our long distance relationship work. Sometimes we were able to hack elite status and got expensive upgrades for free. My relationship with travel and feelings about travel completely changed once I started earning travel rewards. Luxurious travel wasn’t just something rich people did. Are travel rewards vacations really free? Travel rewards provide free travel only to a degree though. It was actually my New Years resolution from 2015 to 2016 when I was paying off debt to not travel. 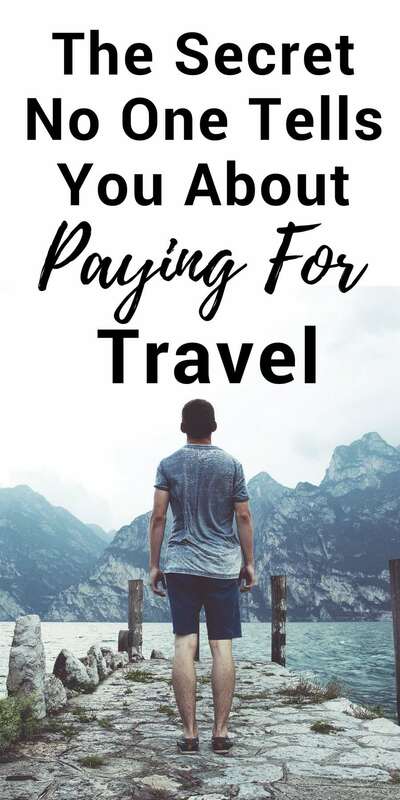 Despite the fact that I could use travel rewards to travel my way through Europe on a completely paid for 10-day vacation (which I did with my now husband in 2013), I knew that staying put would help me pay off my debt more quickly. When we traveled, we still paid for food, activities, and ground transportation, even if our hotels and flights were covered with points. Travel can be more expensive than routine. Side note – my New Years Resolution to not travel never worked. I went to Ecuador in 2015 and Aruba in 2016. It’s one New Years Resolution I’m glad I didn’t keep! Do I really love travel? I love travel, like LOVE LOVE LOVE travel. Maybe as much as Oprah loves bread. The book Vagabonding was hugely influential in determining how I feel about travel more recently. In the book, author Rolf Potts talks about how sometimes we travel for an experience we could easily get at home. For example, the joy we get from making connections with strangers on a street or in a bar can be replicated at home, we just choose not to do it. I really recommend the book for someone who loves travel and wants to think about their love for travel at a much deeper level. I’m part of the 400,000+ member Girls Love Travel Facebook group, which I highly recommend to any lady traveler with wanderlust. The group is where I first discovered this article. I also recommend my podcast, Fire Drill, where we discuss on some episodes how to save with travel. It’s super interesting how my thoughts about travel differ so much from when I grew up. What do you think about travel & class? Did you have travel shame growing up? I also grew up assuming travel was for the well-off. We traveled occasionally, but more often, our vacations included driving to campgrounds (which I also love!). I agree with you, travel can be hacked and you can find cheap locations, but unless you are dedicated to finding ways to make your own food or get cheap/free transportation in cities, the daily expenses can add up! It definitely adds up and sometimes it can be hard to really research ahead of time, so you now where the cheap places are to go. My husband and I like Airbnbs for this reason since you have the option to use the kitchen in most places. Growing up, family travel involved a lot of roadtrips to see other family members and many, many picnic lunches of cheese and crackers and fruit. I was always kind of secretly jealous of the fancier vacations people went on (and omg I wanted my hair wrapped so badly, too! ), but looking back, I’m so glad that’s the way my family did things. I didn’t know it at the time, but early on it built an appreciation for cheaper ways of traveling like staying in hostels and going to the grocery store for simple lunches, and I’m grateful for that! I just opened a travel credit card and am definitely looking to get into more travel hacking. Thanks for the book recommendation-I’m definitely going to check that out. I agree. I think back on simple, family outings and want that for my potential future kids too. It must be harder to raise kids simpler though with the internet and phones and all that. They not only see their friends with hair wraps but all the other kids online. I can definitely relate to this. I went to a private Catholic school growing up where every break my classmates were taking glamorous vacations around the world. My parents worked hard to afford our education so there was never anything left. Now that I have my own family, I’ve made travel a priority. Using some of the hacks you’ve mentioned, my four-year-old has been to Korea, Alaska, Mexico, and several states while I make substantially less than my parents did. It can be done! Really interesting observations! I put that book on my Goodreads list 🙂 When I was young, I didn’t really have a concept of travel being for the rich. I loved our family vacations to national parks, Washington state, and camping. Now I see what you mean about travel – that we crave meeting people, seeing new things, etc. A sense of community. That’s huge! I live in the San Francisco Bay Area where it feels like there’s a shortage of community, and all I want to do is travel. You hit the nail on the head. Great post! Thanks for reading! Your childhood vacations sound amazing. I have enjoyed exploring and camping in the PNW myself. I got the same vibes from San Francisco area. My husband and I made a few good friends there but didn’t feel the same sense of community that we’ve felt elsewhere. Growing up, my family never took vacations or went many places so I did feel jealous whenever I did see my other classmates traveling. To a certain degree, I do feel travel can be for people with more disposable income. For example, everyone talks a lot about credit card hacking, but to get a lot of those rewards, you need to spend like $3,000 to 5,000 in a three-month period time frame. When a person is living on a small income and has low bills, they often can’t meet that threshold. My love for travel didn’t become truly ignited until I moved abroad to Thailand. After living there and traveling to several countries and now living in Australia, I can see how beneficial travel can be. Although I would never tell someone it’s some absolute that needs to be done. You can have experiences and meet new people where you are now. Have you looked into manufactured spending for credit card hacking? It’s a way to hit the required spending amounts while spending little or no money.